Wanted something yummy for breakfast, so I threw these together. *I used raspberry jam in the center because that’s what I had, even though they’re strawberry muffins—but actually, the berry flavors were nice together. I invite you to use strawberry jam (or any other kind of jam) if you see fit. Preheat oven to 400 degrees. Grease 6 muffin cups. Stem and chop strawberries into ¼-inch pieces; mix with lemon juice and 2 tablespoons sugar and set aside. In a medium mixing bowl combine flour, sugar, baking powder, salt. In another small mixing bowl combine egg, milk, and oil. Add egg mixture to dry mixture all at once; stir just until moistened. Fold in strawberry mixture with juice. Spoon half of batter into muffin cups, half-filling each cup (awkward phrasing, but you know what I mean). 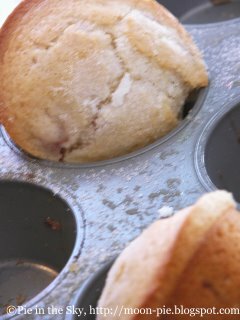 Spoon one dollop of jam into the center of each muffin; cover with rest of batter, almost filling cups. Bake for 20-25 minutes or until golden. At 10 minutes, dust muffin tops with sugar and continue baking. Cool in muffin cups 2 minutes; remove and serve warm. Moral of the story: I LOVE the word muffin. Muffin muffin muffin. Those look so good! 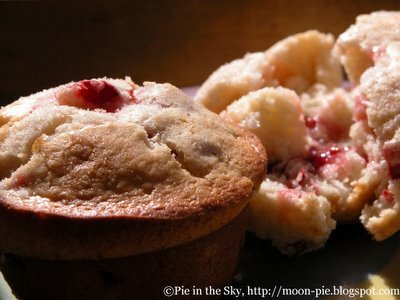 I never think to put jam in muffins. I'll have to try that. Great picture too! I love the jam oozing out of the muffin. YUMMY! I kinda lost my appetite after the little girl got eaten.....The moral should be: if your food runs away from you, eat something else. I thought a muffin was a very small cake???? Anyway, now I want muffins to eat and I still have a chess pie in the kitchen. I've got to stop this Kate...as we speak, Dad is putting my new treadmill together! I love muffins, too. I try to keep some around because we usually have a "teatime" type meal around 4 pm to hold us off until dinner. (We eat dinner pretty late so that it doesn't cut into usable daylight work time.) I'll try your recipe! I miss you already! It was fabulous seeing you yesterday, as well as Jeremy. PS - Got compliments on my nails from all sorts of people today! Ah, pie for breakfast. How could anyone resist? Loved you photos! Good job!! I told Dad I knew the photos where yours because of the sugar sprinkles on top of the muffins; our way of making something good even better. :) Can't wait to see what you come up with next. those preserves rock. i wish i had the initiative to make muffins in the morning. Wow... I want, I want! !